Venetian Blinds are available in different materials. We will be discussing each one as well as their applications: faux wood/plaswood, aluminium, basswood, bamboo. They also are available in different slat sizes: 25mm., 35mm., 50mm., and 63mm. Don’t worry, we will go through them one-by-one below! When we refer to a “Venetian Blind”, we simply mean a blind comprised of slats running horizontally. The slats can be raised completely or tilted either up or down to direction the sunlight. A Venetian Blind is ideal for someone who might want to keep the slats tilted for privacy during the day with the option of raising them completely as well as closing off in the evenings for privacy and light reduction. These are Wood-alternative options for humid rooms of your home. They are available in a 50mm. slat only. Some plaswood/fauxwood has a plastic feel to it, while some have a more natural finish. There are smooth plaswoods as well as textured “grainy” plaswoods. Generally speaking, Plaswood Venetian Blinds are heavier than wood. 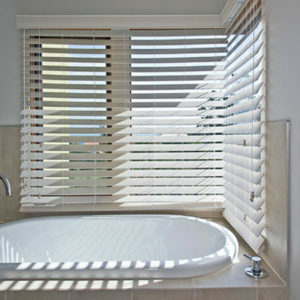 Not all Plas-wood Venetian Blinds are suitable for areas with lots of direct sunlight. These options are completely wipeable and easier to maintain than the other Venetian options. Either way, we have tons of options in tons of colors for any space you need to cover. There are endless options here. Recently, they discontinued the popular 15mm. slat Aluminium Venetian Blind. Now they are available in a 15mm., 35mm., and 50mm., option. There are Alu-Woods (Wood Look), brushed textures, metallics, striped, perforated, and plain options. 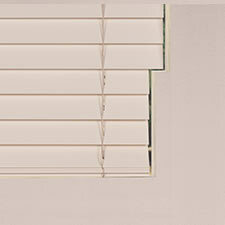 Each manufacturer has different variations of color options and valance options. Generally speaking, 25mm. 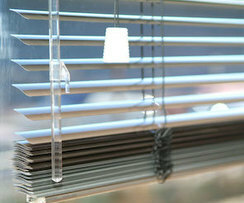 Aluminium Venetian Blinds do not come with a wood valance, except for the Alu-Wood range. This is why some customers prefer the 35mm. or 50mm., options where a wood valance is an option. Our most popular Venetian blind is the Alu-Wood blind. 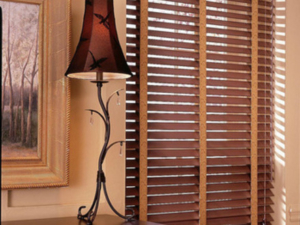 These beautiful blinds come with wood-textured finishes to the slats. They’re available in grey, cream, mahogany or any color in between. They come standard with all the real-wood finishes: Valance, bottom bar, and toggles. This makes them a more up-market option to the standard aluminium blind. Available in 25mm. and 50mm. 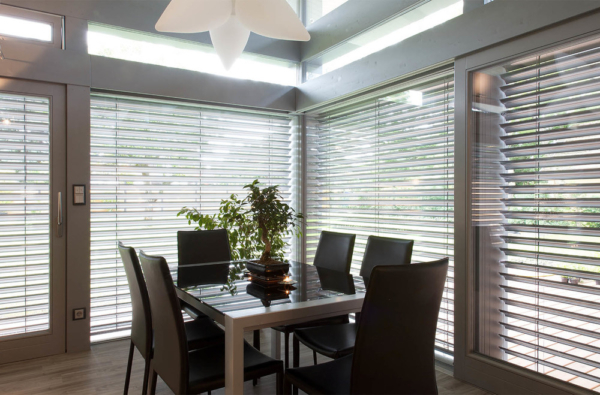 slat widths, these blinds fit perfectly into any room of the home. They’re a brilliant alternative to customers who love the wood look but not the wood price! 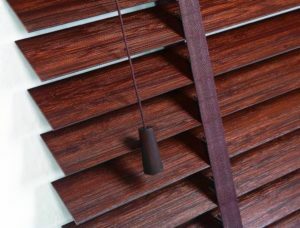 Here in South Africa, all Wood Venetian Blinds are made of Basswood. The differences between the manufacturers are things like coatings (some are UV protected while others are not), and the quality of the components. Additionally, some manufacturers supply blinds with an additional pulley system to make the raising and lowering of the blinds easier than others. Wood comes in a few different price categories as well as widths. Let’s discuss them. Wood is available in 35mm., 50mm., and 63mm. slat widths. The 25mm. Wood Venetians have been discontinued by nearly every manufacturer in South Africa. The 35mm. slats are only available in a select few colors and cost more than the 50mm. widths. The most common slat width for Wood Venetians is 50mm. widths. These are available in an almost unlimited amount of colors. We have basic solids: creams, white, greys, textured, and specialty textured colors. The real specialty item that we sell is the 63mm. Privacy Wood Collection. These larger slats are a great alternative for customers who enjoy the look of Shutters but aren’t willing or able to pay those prices. The Privacy Collection provides more light protection as the ladder strings run AROUND the slats versus THROUGH the slats. It’s a neater finish, with fewer slats than the smaller slatted options. These are available in a number of color choices and make a statement in your home. Ladder tape has been around for years but is slowly making a comeback! Instead of strings, there is a thick tape that runs down the front of the Wood Venetian Blinds. It’s a more classy, elegant look than your normal Venetian blind. Not every manufacturer offers this option so be sure to inquire before choosing your color and material. The ladder tape is available in coordinating or contrasting colors. For instance, a white Wood Venetian blind can look fabulous with a grey or mahogany ladder tape running down! A major benefit of a Venetian Blind versus a Roller Blind or a Roman Blind is that a Venetian Blind can be cut out around skirting boards. Instead of needing to make the entire blind more narrow, creating unnecessary gaps higher up on the blind, a Venetian Blind is cut out effortlessly around the obstruction. There are certain areas in which we CANNOT make a cut-out, but generally, especially for skirting boards, we are able to. This means that the blind can hug the wall and maintain a tight fit the entire way down the window opening. When measured properly, the cutout looks neat and tidy. Whether or not you know what you want or what your needs are, we have you covered. Like, as in, we literally can cover your windows! Let us show you the options and we will advise you on what the best solutions are so you can make an informed decision!